Discuss Ford tuning topics here. Request definitions, discuss parameters, etc. I'd like to be able to use the Moates equipment (quarterhorse, F3, J3, etc) to tune the ECU. Moates is telling me that it has been tried, but that it was unsuccessful in the past. I haven't heard why it has been unsuccessful or how much effort was actually put into it. I don't give up easily, and this seems like it should work. The car has an EECV ECU with the J3 port so from a hardware standpoint tuning shouldn't be a problem. Assuming that this can work, what are the steps to getting this equipment up and running on a totally new platform? Thanks in advance! I would be surprised if the Moates gear doesn't work with your Mazda eec-v ecu. Maybe the problem is obtaining a definition suitable for the strategy the ecu uses. Thanks for the reply! I figured it wouldn't be a hardware issue. My guess is that the definition is the problem. My understanding is that I can go through the hex and do this myself. I realize its much easier said than done, but am I missing something? Also, is the quarterhorse a good tool for this or should I be going for the burn2, FE, and FA? If you want to do real time tuning you'll need the Quarterhorse otherwise if you are content with just burning chips for the tune changes then the Burn2 combo is fine. To develop a definition you'll need to disassemble the code to try to figure out what's what. I doubt you'll make meaningful headway just using a hex editor as you have no reference to compare it to. How is it disabled? 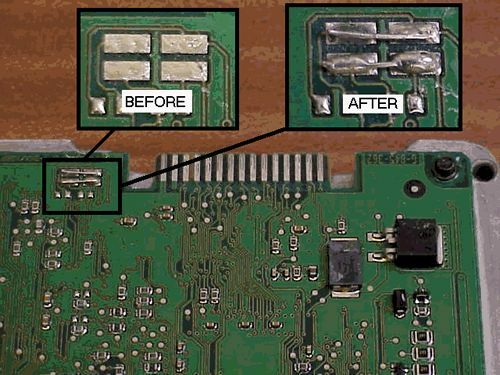 Some eec-v ecu's needed a couple of solder pads joining together to use the J3 connector. Unfortunately I don't know what has been disabled and while I keep being told that it "won't work" nobody seems to be able to give a reason why. The other issue is that even if J3 port can be made to work I'm still stuck without a definition or strategy. I don't mind plowing through hex and making a go at it, but I need some clear and informed answers from someone in the know. The 96 & 97 4 cylinder probes used the same engine, but a very different ignition system. It could be a starting point, but would be far from an easy comparison. My ECU doesn't have pads seen in the image. I haven't been inside other EECVs but I took a few pics of mine. Here's a link since I can't upload the pics here. Dex, thanks for your time! I've spent the last week trying to decide what my options are and I think I've pretty much run this to the end of the line. I don't have time to learn the process and then go through the process of creating a usable definition especially with nothing to compare to. Unless you have any advice or know someone that has the time and would like to make some money I think I'm going to have to move on. There are at least a dozen guys that would put money in at a moments notice to get this done and then MANY more would jump on board as soon as a few were successful. The Mazdaspeed tune is terrible and the car needs this badly. Even with a definition unless the J3 issue can be figured out you may have difficulty re-flashing the ecu if the protocol if different to the Ford one and there's no tuning s/w that supports it. I know the dealer flashes through the OBDII port with a j2534 pass through which is pretty easy to get. So it can be done, Mazda has just gone to great length to keep it from happening. Whilst a J2534 pass through cable is easy to obtain you need the software too. Also, the dealership software might use a proprietary file format for reflashing.